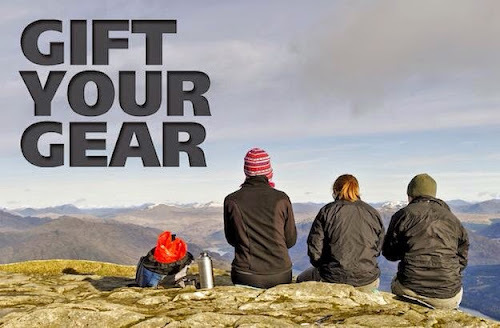 You might recall we've talked before about Gift Your Gear, the brilliant charity that accepts unwanted outdoor clothing and donates it to needy youth charities. It might seem hard to believe, but there are inner-city kids who have never been outside their tiny urban environments, never seen a wood or a mountain, or the animals that provide their milk and meat. The charities that Gift Your Gear supports aim to change that, by giving these kids the chance to explore a bigger, brighter, greener world. This September, Gift Your Gear are once again teaming up with Rohan, the leading outdoor and leisure brand, to make it easier than ever to donate. Simply take your unwanted outdoor gear to any Rohan store, and recieve a 15% discount off their entire range. They'll take any brand of clothing, including children's wear, and rucksacks too. “To date Gift Your Gear has supported over 250 community organisations, youth groups and charities who work with young people in the outdoors. I hope that we can increase this number to 350 by the end of the Gift Your Gear - Rohan event”. I'm already going through my wardrobe to see what I can usefully donate to the cause. The event starts on the 1st September, and runs to the end of the month. Why not see if you can help a disadvantaged kid see how much fun the outdoor life can be? You might, if you've paid any attention to the news or social media over the last few weeks, have seen someone having a bucket of ice water dumped over their head in the name of charity. If you've only seen one person, you're getting away lightly. They're all at it. Pop stars, politicians, pundits and presenters, all seem happy to sit and declare their support for a cure for Motor Neurone Disease, then get soaked for their pains. Meanwhile, my Facebook feed is full of friends and family doing exactly the same thing. Just in case you've been living in a cave, here's the digest. Macmillan, the patient support charity, is raising awareness for amyotrophic lateral sclerosis (ALS) by challenging people to dump ice water over their heads and then daring three friends to do the same within 24 hours, or forfeit a charitable donation. Many people are, pleasingly, doing both. The clever thing about the Challenge is the way it ties into the way we do things now. It's designed to go viral. It's a campaign hooked into our willingness to do something a bit silly and put it up on Facebook: a quick way for us to show the world that a) we're up for a laugh, and b) we're good people that care about those of us that have been dealt a tougher hand. There's nothing new in this, of course: Comic Relief have been doing it for years. But the Ice Bucket Challenge ties into some very modern obsessions, specifically the selfie. We love taking pictures and videos of ourselves and putting them online to share with our friends. The Ice Bucket Challenge gives us a good excuse to do that. WIthout the cameraphone and social networking, the notion would have collapsed weeks ago. It's quick and easy to do, as well. Shoot, upload, donate, done. Now hand me a towel. There's the chain letter aspect to consider as well. You don't just soak yourself--you pass on the challenge to others. It's not surprising that the whole thing has grown so quickly. It's set up to expand exponentially, dubling and trebling with every person that passes it on. At this rate, every man, woman and child on the planet will have been soaked. Within reason, of course. Palestinians have already launched the Rubble Bucket Challenge, making the point that not all of us have precious water to chuck around so freely. This is the great thing about the whole phenomenon: it's a simple thing, a joke that can be filmed in one shot and dumped online incredibly quickly. That simplicity makes it a potent image that can very easily be remixed to fit a new message. There have been complaints that the Ice Bucket Challenge reveals our narcissistic tendencies, and shows us to be a self-absorbed bunch that will only raise money for charity when there's something in it for us. This is true to a point, but it's snarking at a basic aspect of human nature. The need to be loved and appreciated, which will spur us on to do very silly things indeed. Personally, I like the notion of making charity donation a fun and inclusive activity. As traditional donation and sponsorship routes dry up and revenues shrivel, charities have to think outside the box to make sure the money they need is coming through the door. The Ice Bucket Challenge is the best example of that kind of lateral thinking I've seen in a while. Expect to see more like it soon. Saigon Socialite, a company founded by Vietnamese financier-turned-fashionista LanVy Nguyen, is melding sleek modern leatherwork and traditional wood-carving to create a very special hybrid. Her shoes, born out of her love for the intricate work of Imperial-era craftsmen, are a potent symbol of how Eastern tradition and Western knowhow can be brought together in startling and striking ways. Pagoda carving dates back hundreds of years: the work of skilled artisans who would apply their craft to everything from doorframes to shoes. It was these wooden mules that sparked Nguyen's interest. She recalled her grandmother talking about how the mules were a way of announcing your arrival (by clapping the soles together) and a status symbol. The stars aligned in favourable ways: a NGO she had started up was approached by a cobbler looking for funding who had just the skills she needed to update the traditional forms. The cobbler was averse to making women's clothes, but he liked the notion of making money. A deal was struck, and Saigon Socialite was born. The shoes, which are rolled out in six different designs and a limited edition of 2000 pairs a year, take over two weeks to make. The wood, harvested from local orchards, is blocked, dried, carved and oiled before the leather uppers are added. The artisans are careful to ensure that the designs are sensitive to the overarching culture: carving a four-tailed dragon, reserved for important pagodas, would be seen as disrespectful, for example. These are not humble shoes, and the impact they have had on the local economy is similarly impressive. Nguyen has marshalled the craftspeople of 48 villages and invested over half a million dollars in equipment and training in a venture that has benefitted 30,000 Vietnamese. Better yet, she insists that those skills and investment are returned to the local areas from which they came. Artisans are encouraged to pass on their skills, or help out in disaster-struck zones where their help is needed. Saigon Socialite shoes are upscale and exclusive, and the aggressive clash of modern and traditional forms won't be to everybody's tastes. But the thinking behind them is the very definition of good ethical fashion: employing local craftspeople and embracing their traditional skills in a way that benfits their communities. I think the shoes and the business thinking behind them are exemplary. We're deep in the throes of festival season. V rocked Chelmsford last weekend, and my personal favourite, the Reading and Leeds Festival, is gearing up for the Bank Holiday weekend. While the music is the memory that most people will take away with them, the site clear-up crews wish they'd take something else--namely, their tents, tarpaulins and sleeping bags. It's estimated that one in six tents brought into a festival site are left behind once the music ends. That is, if they're not just slung onto a bonfire, a dangerous ritual on the Sunday night that's been clamped down on of late. Sadly, many of the kids that go to gatherings like Reading view the tent that has been their home for a weekend as simply disposable, causing something of a logistical nightmare for the volunteers that clean up after them. To say nothing of the impact on landfill. An immediate fix for the problem isn't easily obtainable, although recycle bins for unwanted tents have made a dent in the pile up. But there are people looking into the problem. Students at Nottingham Trent University (who have something of a rep in the sustainable fashion game) made a point last year of seeing what could be done with festival waste. Using tarps, tents and sleeping bags left over from last year's Secret Garden Party, students studying for a degree in fashion broke down and reformed the unwanted gear into a brand new product: a dress. This is a proof of concept, but of nothing else it shows that something can be done with that discount tent once you've done stinking up the inside with the debauchery and the days without showering. There's some good PR to be had here as well. If festival-goers can see that there's a future for that knackered old sleeping bag, then they're that more likely to donate it, rather than simply leave it in a field. Make it a cool, attractive thing to do and they'll be queueing at the recycle bins. If you're off to Reading or Leeds this weekend, have a great time, and be nice to the stewards. They're wearing t-shirts supplied by Pier32, you know! We're all agreed, I hope, that deforestation is A Bad Thing. Vast swathes of the green lungs of the world are disappearing daily; to feed mankind's hunger for virgin wood, and to clear land for other, more profitable crops. But did you realise that fabric production is the cause of a significant percentage of the disappearing forests? Rayon, viscose and modal are all basically woodpulp that's been chemically treated and turned into cellulose fibre. Non-profit organisation Canopy has estimated that 100 million trees are lost every year to fabric production. While this fabric is technically recoverable from landfill, once blended with other fibres or decorated, that biodegradability is lost. When you factor in the environmental damage that occurs as a byproduct of deforestation, or the fact that Indonesia's logging activities have made it the world's third most-polluting nation thanks to carbon debt, it's clear that something needs to be done. Forests are not as renewable as commonly thought, and it can take decades for virgin forest to be replaced once it's been clear-cut. Fortunately, some big fashion names are taking action. Inditex, home to brands like Zara, along with H&M, Stella McCartney and Quiksilver have all pledged to halt the use of cellulose fibre in their products under a strict three-year turnaround. By 2017, they plan to replace tree fibre use with recycled fabrics, non-wood alternatives, and organic and socially sustainable cottons. Their pledges won't just ease the carbon release caused by deforestation: it'll also protect the fragile habitats of some of the world's most vulnerable animals, and the homes of indigenous tribes. "To help prevent the projected expansion of logging for textiles, clothing brands need to be on board. Once apparel industry leaders start refusing to source from endangered forests, their suppliers will be motivated to find better, more sustainable, alternatives." 6% of all fibre comes from cellulose sources, and a shift away from use of these fabrics can only be A Good Thing. It's important to let the big names know that logging is not the only way. Let's start off by signing the Canopy-Style Pledge, and let the forests grow in peace. Neil Young has always been one of those artists that has gone his own way. For his critics, that shows him to be curmudgeonly, intractable. But Neil ignores them, and treads the path that he sees as most righteous. As you can tell, I'm a bit of a fan. His latest move has endeared me to the guy even more. On his last tour of Europe, he gave out free organic-cotton t-shirts to the audience. It seems that was the opening salvo in a green offensive, as he recently outlined on his website. Neil is removing all traditional cotton promotional wear from his merchandising arm, and he's urgng his fans to do the same. Neil takes time on his post to outline the reasons for the change, citing the heavy use of carcinogenic pesticides and water as major reasons to move away from traditional cotton. He mourns that hemp's not widely available enough to be used as yet. With the increasing relaxation in marijuana legislation, though, who knows? He also has a few hints and tips for the care of your free t-shirt, noting that 75 to 80 percent of a garment's environmental impact comes from washing, drying and ironing. I've never seen the point of ironing t-shirts, so I'm glad that Neil Young and I think alike. We shouldn't really be surprised by any of this: Neil Young's stance on the environment is well known. He recently supported a Kickstarter that allows retasked cell-phones to be planted in vulnerable forest areas, acting as an early warning system against illegal logging and poaching. But it's great to see such a major figure taking a radical stand to protect the earth. Read Neil Young's post on his website here. You'll need to click through from the opening splash page. You're a fashion designer, and you're passionate about sustainability. You have a vision: a range of clothes that's completely recyclable. Congratulations. The industry needs more people like you. The thing is, how do you go about making sure that your vision gets carried across from the sketchbook to the shop floor--and most importantly of all, to the recycling centre? Can you be sure that the materials that you've so carefully chosen and incorporated into your design can be easily broken back down? Indeed, do you know what happens when your clothes hit the recycling bins? In The Guardian, Maxine Perella recently followed four designers as they found out what happens to clothes bound for their second life. They took part in The Great Recovery, a "design residency" at three sites: a community drop-off point in Camden, an Ecopark in Edmonton, and a textiles recycling plant. The brief: discover the challenges inherent in taking a design-led piece of clothing and breaking it back down to its constituent parts. Those challenges are wide-ranging, and show just how far we have to go before cradle-to-cradle models become the norm. The designers found that products dropped at the Camden site were already assumed to be waste once they'd been deposited. At the Ecopark, the incentive is on tonnage processed, with little focus given to separating out materials. Things are little better on the design side. Sophie Thomas, co-director of design at the Royal Society for the encouragement of Arts, Manufactures and Commerce (RSA) and head of The Great Recovery points out that sustainability is rarely part of a project brief, and designers are rarely given the time to properly work out how to roll it successfully into their clothing. They tend to fall back on outdated or marketeer-led notions of what sustainability means, with often unsuccessful results. It all sounds gloomy, but while the project showed up the flaws in the system, it also made it powerfully clear what needs to be done. Waste management experts have lots to offer at the design stage, while designers have the ability to view the bigger picture, and visualise how their products can track through the different stages in the recycling process. Communication, as ever, is the key, and both sides found The Great Recovery to be instructive, insightful and inspiring. The scheme, I'm glad to say, is moving to a second phase in September, with the aim of putting the earlier findings to work in finding practical solutions to the challenges of modern sustainability. There's a long way to go, but what we've seen so far is a great start. The Guardian, as ever, has more. Here at The Pier, we're used to seeing clothes made out of all sorts of unusual material. Heck, at Pier32 we even sell some. Fancy a jacket made out of shredded drinks bottles? We can do that. But artist Robin Barcus Slonina is taking the process one step further. She works with materials like poker chips and pine cones to create dresses-as-sculpture, artworks that are designed to make us think about nature, the consumer society and the ephemeral nature of fashion. "It took six weeks to gather and clean the sap off the cones, then meticulously attach them to a wire form I contructed in the shape of a dress." "I have always simply liked the shape of the dress as an abstract form, and I think it is interesting that it has come to represent the female in our culture." Her work on consumerism and urban waste, which included a dress made completely from items bought from a 99c store and one built out of rubbish bags, has gone down less well. The 'Garbage Dress', which she was photographed wearing in New York City, raised eyebrows in the Big Apple, and brought criticism that she was doing the city a disservice. But Robin countered that her first visit to New York coincided with a garbage worker's strike; a powerful memory that she wanted to celebrate with "a couture, jet-black, fashionable New York dress that... represents all the dramatic contrants inherent to New York: wealth and poverty, art and homelessness--beauty and trash." "I love every dress, and each one holds precious memories of the place where it was created and the volunteers who became a part of the experience." Fashion should be fun. Although Robin Barcus Slolina's pieces are not the most wearable, her sense of playfullness and thoughtful approach to her art mean that the dresses, and the Vogue-style photos in which they are most likely to be seen, have an impact that's much more meaningful than a one-note joke. As she says, the dress-form has an iconic power. Subverting it gives her work a pleasing sense of sharp humour that is cut with clever social commentary. There's nothing simple about her dresses. They're complex structures that are as thought-provoking as they are beautiful. For more, check out Robin's website.